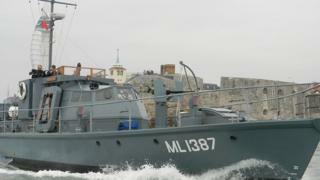 A sail-past to mark the centenary of the Royal Navy's Coastal Force boats has been held. Known as the "Spitfires of the seas" the small, fast torpedo carrying wooden vessels served in World War Two. Their role was to keep shipping lanes clear, fight German boats at close range, land troops and gather intelligence for D-Day. The sail-past at Portsmouth Historic Dockyard was led by HMS Medusa, a harbour defence motor launch. Alan Watson, captain of HMS Medusa said the small craft which could "punch hugely above their weight" played a crucial role. He said: "Their whole ethos was to rush in, cause chaos and get back out again." The event marks the date the first six coastal motor boats were delivered to the Royal Navy. At its height in 1946 over 2,000 vessels and 30,000 personnel formed coastal forces.